Alexander Volodin - "Reflections Of Time"
Born in 1982, Alexander Volodin may be a young composer and musician, but has already participated in the 30th International Competition of Electroacoustic Music and Sonic Arts in Bourge, France, and the Third All-Russian Competition of Young Composers - Crystal Tuning Fork in Russia. 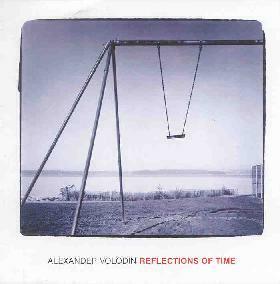 Reflections of Time is his first album, and with the exception of guests on flute and violin, all the music is composed, arranged and performed by Volodin. "The Flower Is Growing Up" opens the CD and is a sound-art collage piece that combines rushing ambient and thunderous waves, howling tonal swells, alien crowd chatter and a banquet of UFO fun. My favorite part is near the 7 minute mark when the multi-layered alien glom transitions to a heavenly organ grinder in a church choir performing in a carnival of the absurd side-show segment. Very cool. Tracks 2-4 comprise "Circles", another sound collage work that can be sometimes spacey, at times high volume aggressive, and absolutely brain crushing at others. But once again Volodin displays a penchant for bringing together seemingly disparate sound elements into a cooperative whole that is continually engaging and held my attention throughout. Clocking in at 30 minutes, "The Way To Star" is Reflections Of Time's epic track. It has a machine-like droning experimental sound collage feel that follows in the path of the rest of the album, introducing a non-stop parade of sounds and samples. But there are also some orchestrated parts that have an equally droning, but more ambient quality, and some lengthy segments of pure ambient drone, peppered with miscellaneous sound bits. Tracks 6-8 make up "The Music Of My Memory", which continues Volodin's now trademark sound-art style. I hear a use of voice samples that brings to mind the works of Mika Rintala and Hal McGee. But we've also got some of the harshest and highest volume moments of the set, my favorite part being when the music builds to a volcanic roar, only to descend abruptly into a folk acoustic stringed instrument pattern, but just as quickly shifting gears and soaring into cosmic space, accompanied by a children's melody. A very creative use of contrasts. In terms of pure variety Volodin seems to be an endless source of ideas. But where he really succeeds is in the molding and melding of these bits and pieces into larger structural frameworks. Lots here for sound collage fans to enjoy.